when Nickman served as general chairman. 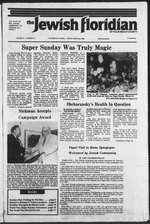 15,000 calls from the Hyatt on Super Sunday, March 16.
the British "Group of 35"
tributes substantively to Catholic-Jewish relations. of Italian Jewish Communities, "or it could be a perpetuation of ambiguities." tain it would be an historic precedent. tant step in the direction of an ever more rewarding dialogue." of possibility, awaiting only the appropriate "conditions." Hotel for their annual dinner-dance, Dr. and Mrs.
provided by the Joey Roberts Entertainment Group. chairperson; Zelda and Dr. Joseph Zeger. Most of the guests attending danced a round of the Hora. were performed for the guests. Edwin Stein, campaign co-chairperson, conducted the fundraising. Beach home of Mrs. Eugene J.
ing notice of the rating, Mr. E.
working at the Israel pavilion. presented on June 1, 1986.
endorsed by at least 25 members of the Federation. supplied armed forces that money can buy. we're for it, they're against it. And vice versa. defend themselves against Iran or against internal subversion. Sidewinders and Stingers won't save it. Remember the Shah? timidating anymore or, at least, it shouldn't be. it has no rationale for one. It just won't work. JSTMASTER: Send address changes to The Jewish Floridian. Advertising Director Staci Leaser. Phone SStKS? le*iSh Florulian doe*; not quaran'. 'i' Krfsnmin i( Mr', tlendlte Ail.. SUBSCRIPTION RATES lo( ai Area $4 Annual i? Year Minimum $/Mi or Dy It N .
to Eilat, Israel's Red Sea port. hop you could be in Egypt." tion remains at a standstill. Mubarak. But that isn't much. attention of a public official. official who will precede them. variety show features Israeli and Yiddish music and humor. tion Media Presentation 3:30 p.m.
American Red Magen David for Israel Netanya 1 p.m.
10 a.m. American Jewish Congress board -12:30 p.m.
10 a.m. Jewish Community Center board 8 p.m.
ing needs of our people .. .
ty. Will you be there? Area of Palm Beach County in the Regional Spelling Bee. the year of your gift. savings in your estate taxes. estate in a lower tax bracket. Roneet Weingarten. the live broadcast of Mosaic. helped replenish everyone's enthusiasm. helped the first shift of volunteers raise over $100,000. ing a Super Sunday car wash.
County, 501 S. Flagler Dr..
Suite 305, West Palm Beach. 1 moment of well-deserved rest. gifts and pledges were received. to many members of the Jewish community. sky worked on the final figures. before addressing a group of eager volunteers. asked to make a contribution. take place April 6 to April 9.
gram is a life-line to shut-ins. Community Center for children 2xk to 4V2 is now in effect. limited in all age groups. Kressal, Early Childhood director, at 689-7700. Att'n. : Joel. For additional information call 689-7700. Center to plan activities for April. mix and match suggested ideas. Everybody is welcome. above, offer Israeli urban dwellers a retreat from the tensions of modern city life. will also celebrate the day. have the First Seder, April 23.
by Brian, son of Mr. and Mrs.
ing Service at 8 p.m.
challah, and a kiddush cup. not remain for a later service. The regular service at 8 p.m.
Sunday. April 6 at Temple Israel. the stability of his regime. who fear for their lives. of the woman who was killed,"
president. Dr. Richard Lynn, and co-chair Jonas Barcnholte. David, of 44 Coconut Row. Palm Beach. side Memorial Chapel, West Palm Beach. the open and tell everyone. synopsis of the editor's replies. dispensed by the Bintel Brief. to the society of a cult. short of the majority they need to form a government. guest workers, many of whom are of North African origin. Geriatic Center residents. Interested volunteers are needed. ext. 188 for further information. ... Well, Now You Will! Where? OPEN JUNE 27 thru SEPT. 1.
special Circle Lodge brand of good times. AFTER JUNE 15, MAIL TO. Fredericks are (left to right) Merrill L.
Titles, Sara Fredericks and Eugene J. Bond Brunch at the Sandpiper Bay Hotel on April 6. WILL DIE OF BREAST CANCER. TAKE LIFE INTO YOUR OWN IIANDS. THE FUTURE OF IEALTII CARE IS 1 ERE. Thanks for making Super Sunday '86 a truly magical event. thousands of your fellow Jews throughout Plam Beach County. munity locally, overseas and in Israel. has just ended in Jerusalem. of employment, it was noted. * SPEND A VACATION, NOT A FORTUNE! Tennis & golf nearby. Outdoor putting groan. LARGE POOL. (914) 292-6545 after 9 p.m.
>^. a^L Before tin- Florida heal wilts yuu thin summer. those present at the ceremony. would not exist any more ..
low rates for extended tay*. the Union of Councils for Soviet Jews. current situation in the Soviet Union. out prior to his arrest. it is "against the interests of the State." because of his application to emigrate to Israel. PUNNED ACTIVITIES / Breakfast. Lunch and Dinner. Eileen Nickman hangs a portrait of her husband Myron J.
while her children and grandchildren look on. ween Israel and its neighbors. 1985. Since its inception in 1951. Hotels of Miami Beach >.m < . * >..
mail was sent out late, or 10 the wrong people. once, or twice, but everv time! day. May 30 to Monday, June 2.
ducted by Ella Nadrich, highlighted the day. Membership Luncheon" on April 14 at the Sheraton Hotel. My Act Together" at the Burt Reynolds Dinner Theatre. May 4, "Dames at Sea" at the Royal Palm Dinner Theatre. 9, noon, at the "Assembly" Plaza Del Mar, Manalapan. entertainment "Annie Comes to Palm Beach East." Contact for reservations Harriet Freedman: 2505 S.
Ocean Blvd., Palm Beach 33480. Kane; Recording Secretary, Ruth Rothfarb. ners, Okeechobee Blvd. and Haverhill Rd. popular songs in many languages. Luncheon chairperson is Lara Hyman. large assortment of interesting items will be on display. For information, call Bertha Rubin or Lillian Schack. Birnbaum and her musical notes. songstress. All guests are honorees! West Gate of Century Village on Okeechobee Blvd. For information call Ed Lefkowitz. the Mental Health Center, 45th Street. mation, call Ruth Straus. Somerset 1-173.
ment at the Sheraton. For information, call Gus Weisman. May 14 Newport Hotel and Pub Restaurant Miami. vations are limited. Contact Matty Ritz. and bric-a-brac in good condition would be most welcome. A briefing was held on U.S.
mittee of the Senate and U.S.
ship organization in the world.